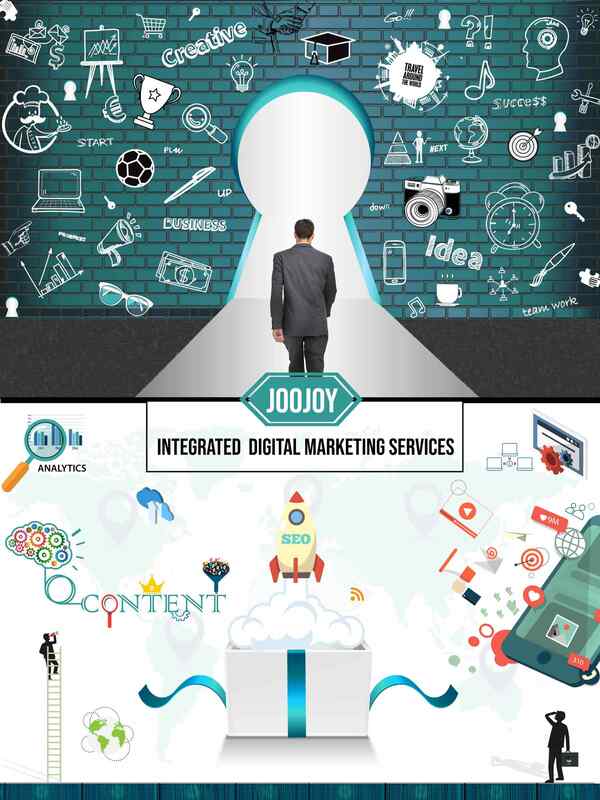 Welcome to Joojoy – Advanced Digital Marketing Courses in Salem !!! 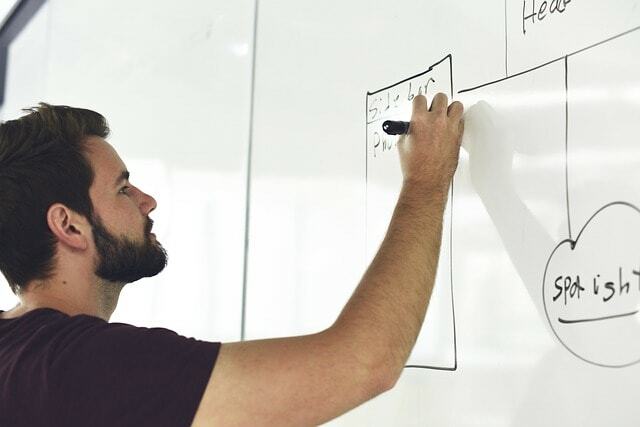 When you read this article, it means that you like to know about digital marketing or you are searching for best digital marketing courses in Salem. Well, here am I to help you with that. I will share my knowledge and opinion which gives you a good clarity. 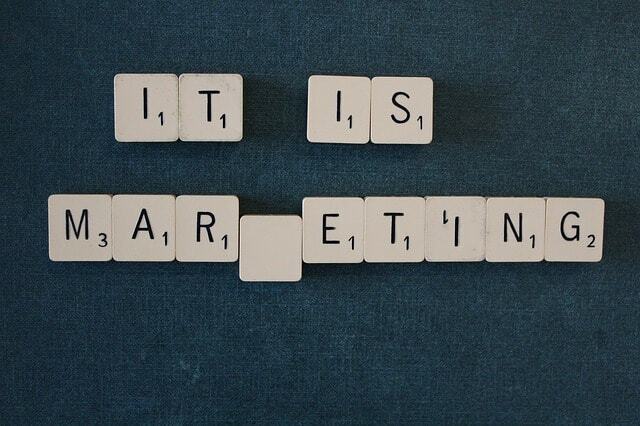 Simple words, digital marketing is the art of getting customers/followers via digital means. Digital marketing is as same as the marketing process. But the difference is that in traditional marketing, we will use TV, radio, and newspaper to promote our business/oneself. Here, in digital marketing, we use digital tools such as Search engine, Social Media, Website, E-mail and so on. If you want to choose digital marketing as a career then you should know why digital marketing is the next big thing in India. 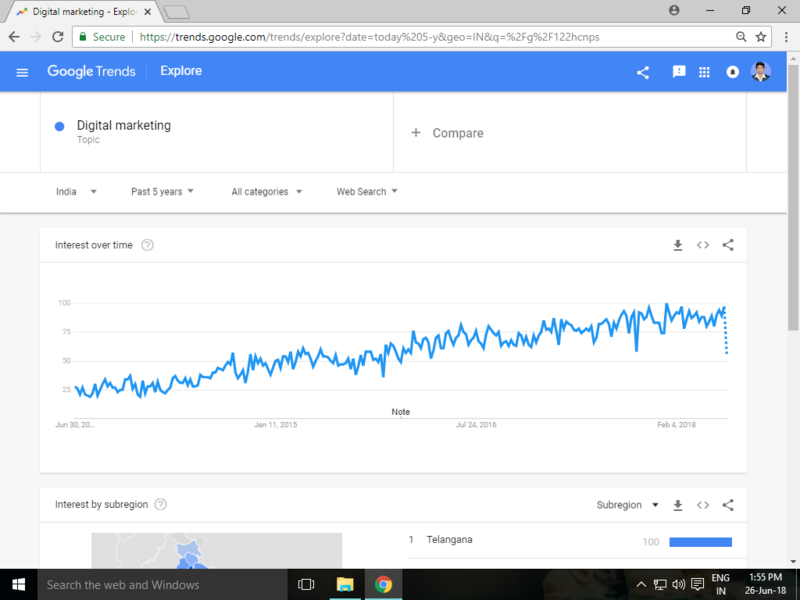 The picture given above shows an idea of the digital marketing trends of the past five years in India. Just think! In 90’s, we people were blindly believing all that was spoken on TV, radio, newspaper ads. But now, most of the people don’t believe in traditional ads. 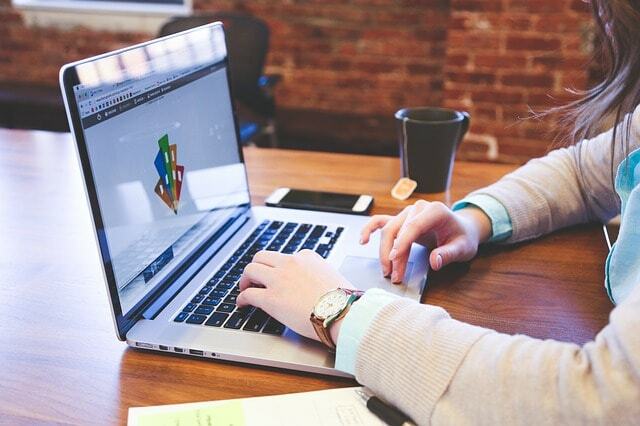 This is the reason for the tremendous growth of online marketing in India. 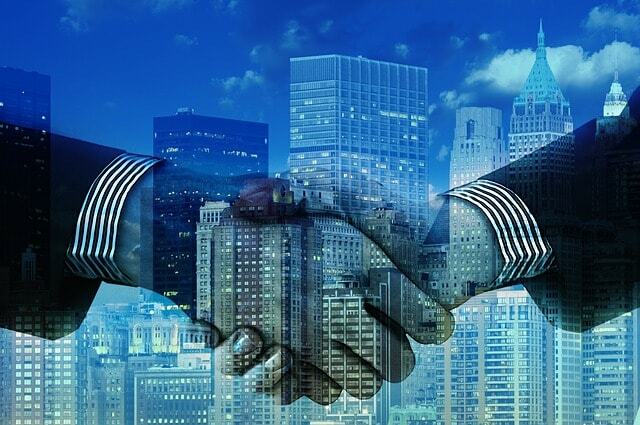 Many companies have started to introduce a separate department called digital marketing in their organization. Moreover, digital marketing companies/agencies are being established consistently in India. So, we can see, there is the huge demand for internet marketing experts, worldwide. I hope you now clearly understood what digital marketing is all about and its growth opportunities. The Course duration will be approximately one month and depend upon the student’s capabilities time period will vary. If you really like to join digital marketing courses in Salem, you can apply for our free digital marketing demo classes. Once applied, we will contact you as soon as possible and arrange the free demo class as per your convenience. 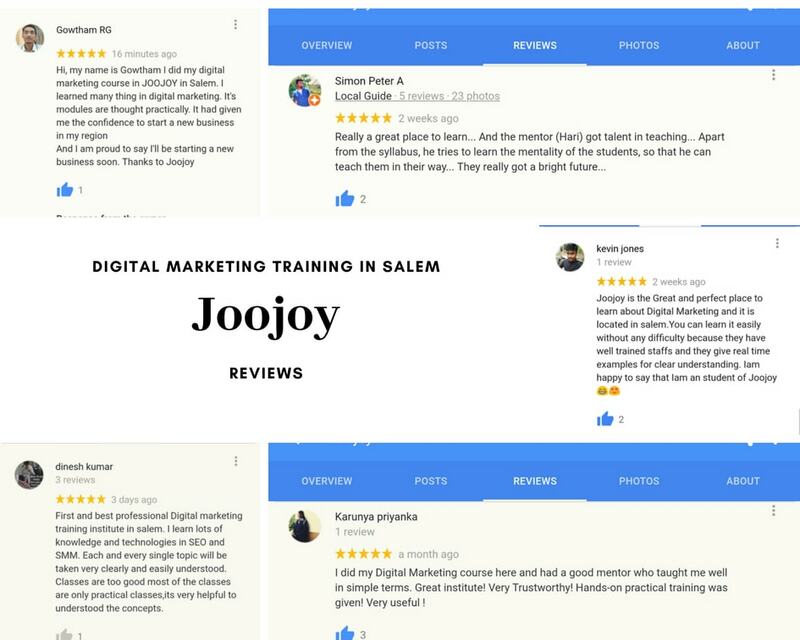 Here are our beloved students’ reviews of our digital marketing training in Salem. Before going into details about digital marketing modules, I would like to answer for one question. The best way to learn digital marketing is through blogging. Because if you want to become an expert in any field you should learn from scratch and also you should follow the trial/error method. As we already discussed, the best way to learn digital marketing is by blogging. So now you have to choose a particular niche topic for your blogging. 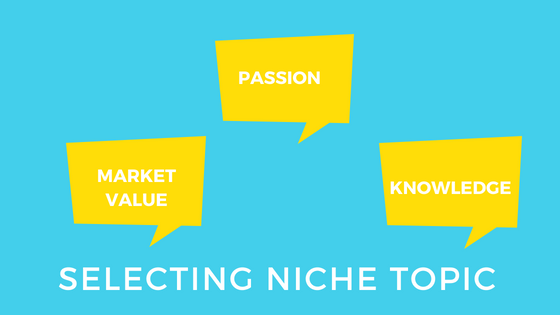 Choosing a profitable niche topic is one most crucial step. So you have to spend more time to identify that niche topic. Don’t follow the money-oriented niche. 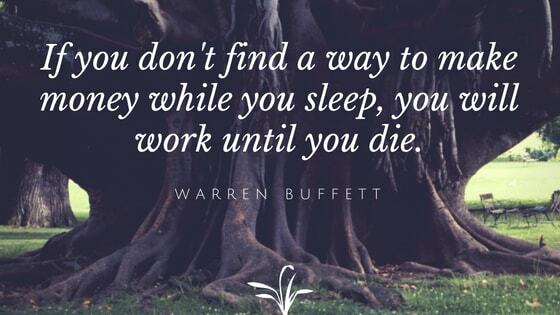 Instead, follow your passion and also remember you should have some knowledge of that niche. Finally, to identify the market value of that niche you have to do keyword research. Through keyword research, you can be able to come up with the right decision regarding your niche topic. To create a blog/website you should know how to build it. You can use the WordPress to build your blog/website. I can understand that you are wondering about how to create and use the WordPress tool. To use the WordPress tool, you need domain and hosting. There are many companies that are available in the market to provide domain and hosting services. We would suggest you go for Bluehost or Siteground because their customer support service is excellent. And most importantly don’t go for the free platforms because the search engine does not encourage the free platforms. Invest the small amount now so that they can make profits in the future. Website Designing Training in Salem. If your site is not in the first page of search engine, then there is no use in maintaining your blog/website. This is because more than 90% of the people don’t visit the second page of search engine. So obviously, if your blog /website is not on the first page, you can’t generate any traffic and sales. Now, you can understand that SEO is a process of optimizing our site to rank in the first page of search engine. We providing SEO Training in Salem. Basically, SEO is divided into two components such as on-page optimization and off-page optimization. On-page optimization is a process of creating a well-structured, relevant, quality and user-friendly site and then send the site’s signals to the search engine. Google will crawl our website and check their algorithms if you have done on-page process effectively, then your site will be in the search engines on the first page. Off-page optimization means to promote our site outside of our website. Here, we have to build more high-quality backlinks for our website. Alert: Be aware, if we do build more low quality and irrelevant back-link to your website then there is high chance that your website may perish by search engines. Some off-page factors are high-quality backlinks, social signals, brand searches, user behavior in your sites. In 2020, more than 2.5 billion smartphones are going to raise in the market. People are crazily going to hang out on Facebook, Instagram, YouTube & Twitter more. So it is wise that you stop using the social media for time pass. Think and use the social media in a positive manner. Let’s do personal branding, create a community, generate passive income and help local business more than that promote your business via social media. If you desire to use social media more effectively, then you have to know every platform pulse. So understand each social media algorithms and come out from the crowd. Social Media Marketing Training in Salem. More than 80% of the people use the search engines to go for any websites. You can target your audience make more sales by using search engine marketing. Search engine marketing is a paid advertisement if you want to generate more traffic. If you want to generate more conversion for your business in a short period of time you can use the search engines marketing. Search Engine Marketing Training in Salem. Email marketing is mainly used for maintaining the good relationship with your client/followers. If you use email marketing as a promotion tool it will not work out. Consider the email marketing tool as a bridge. So it would help you bond with your clients/followers. We have few other topics that also we cover in this digital marketing course such as affiliate marketing, web analytics, content writing. One to one attention is given at Joojoy where you can learn a lot. It is this special feature where you can gain a good learning and clarify your doubts. Friendly coaching is provided. The staff-friendly environment aids you in clearing the mist of fear that prohibits from having a good learning. The staff acts as the facilitator where they make the learning process easier and you can have a practical learning experience. Even after you finish your course, you are free to walk-in by fixing your appointment when you have doubts with the implementation of your learning and thereby get them clarified. Digital marketing course is given to in more practical terms rather than theoretical terms. We take limited students per batch in order to give individual attention. If you get to miss classes, unfortunately, backup classes are provided where you get to learn the classes you missed. When you invest in yourself, your career progression begins. Here’s a reminder for you once again! In case you require more information or clarification of this digital marketing course in Salem, Feel free to sign up for our free digital marketing demo classes in Salem. We’re here to help you! !